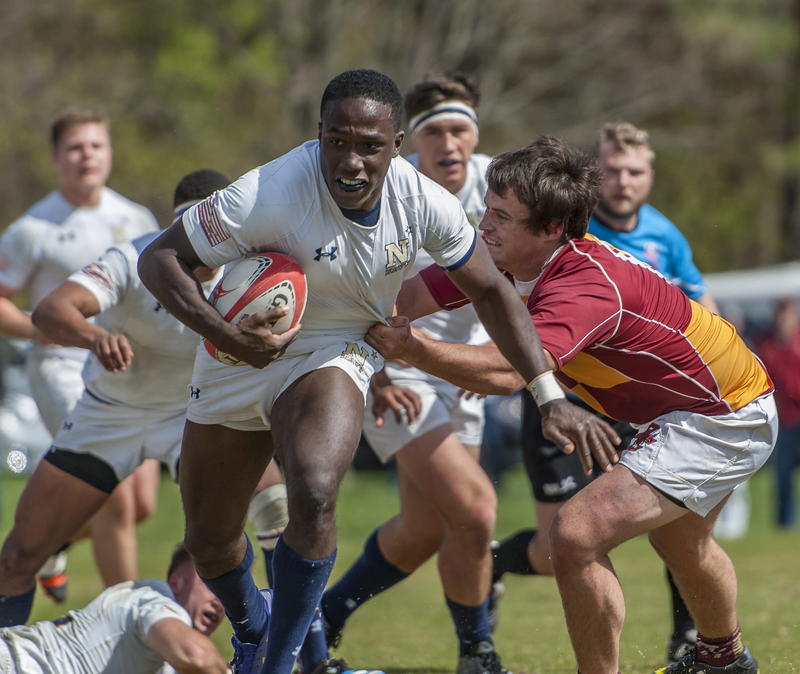 Jeff Malm-Annan was a try-scorer for West Point. Photo courtesy West Point Athletics. Here's a rundown of the Varsity Cup 1st round. Army defeated University of Notre Dame 41-8. A Jon Kim penalty goal and a Luke Heun try, converted by Kim, put Army up 10-0. But Notre Dame replied with a penalty and a try to make it 10-8 30 minutes in. However, just before the first half ended, Austin Rutledge scored to make it 17-8 (with the conversion) and that gave Army some cushion. Navy v BC. Photos Colleen McCloskey. Tries from Jeff Malm-Annan, Sam Sutera, Harrison Farrell, and Eli Brown capped off a torrid second half for Army. West Point had a pair of seven-minute defensive stands deep in its own territory to keep Notre Dame from scoring. The second happened well after the full-time hooter. 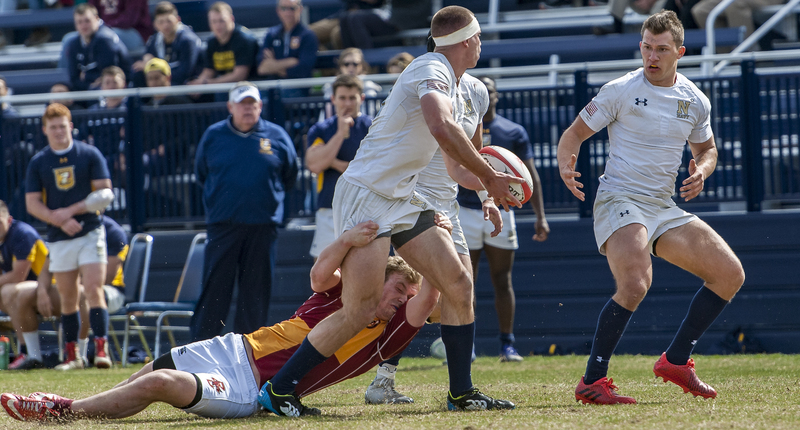 Navy defeated Boston College 64-14. Gardy Lebon played superbly at scrumhalf and No. 8 Connor McNerney was once again a powerhouse as Navy kept up the pressure all day long. "We felt we let Army off the hook in our last game," said Navy Head Coach Mike Flanagan. "We were up 18-7 and let them back into the game and ultimately lost. Today we played a full 80 minutes. BC is tough, and they played hard all game, but I was pleased with how we closed it out." BC made it 12-7 in the first half, but the key play may well have been right on the restart, when Trey Fullilove got possession of the ball and took off, and set up a try under the posts. From there Navy didn't look back. 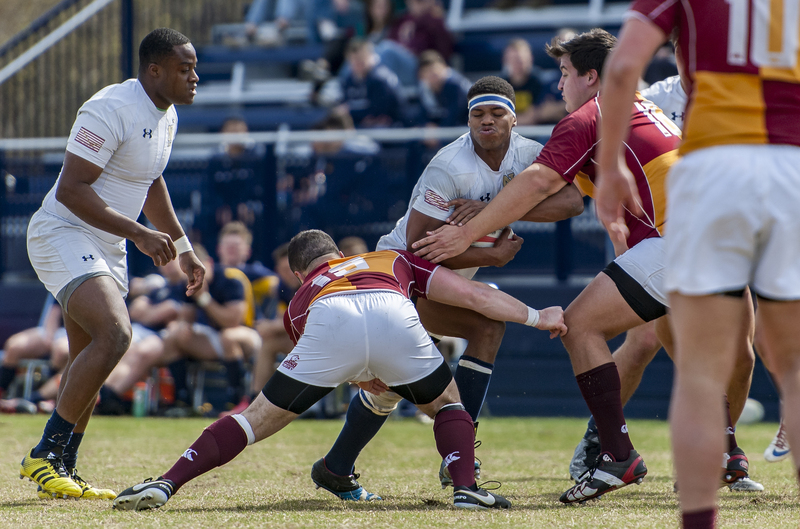 Plebe prop Bo Kendrick-Holmes played a solid game in the scrums and scored a try as well. Center John Fiorelli also scored a key try. On defense, "we checked their backline pretty well," said Flanagan. Clemson held off Dartmouth 36-29. Clemson led much of the game but couldn't quite shake a tenacious Dartmouth team and it was a close game until the end. Dartmouth ran out to a 17-7 lead thanks to two tries from wing Max Parker and one from flanker Benji Hannam, with fullback Dawit Workie slotting the conversion. Clemson got a try from Liam Helstrom, which Drew Dommel converted. Clemson then mounted a bit of a comeback, with flanker Joel Jaldin scoring from close in, and Dommel's conversion making it 17-14. That's how the first half ended, but Clemson's depth started to show as they ran in subs. Wing Colin Gregory raced in to give Clemson a 19-17 lead, and then capped off a nice movement to make it 26-17 with Hunter Dawsey's conversion. Dartmouth had been held scoreless for close to 40 minutes, but center Julien Johnson's try brought his team within four at 26-22. But the Tigers replied through Ethan Harr (Dawsey converted) before Luke Beinstock's try edged Dartmouth closer at 33-29. With time winding down, Dawsey iced it for Clemson. Penn State defeated Harvard 100-7. Fourteen different PSU players scored tries, with only Mike Eife, Jim Haily, and Oren Patel-Champion the only players to score more than once. It was a fairly dominating performance from the Nittany Lions. Arkansas State was in control, too, beating Oklahoma 69-7. 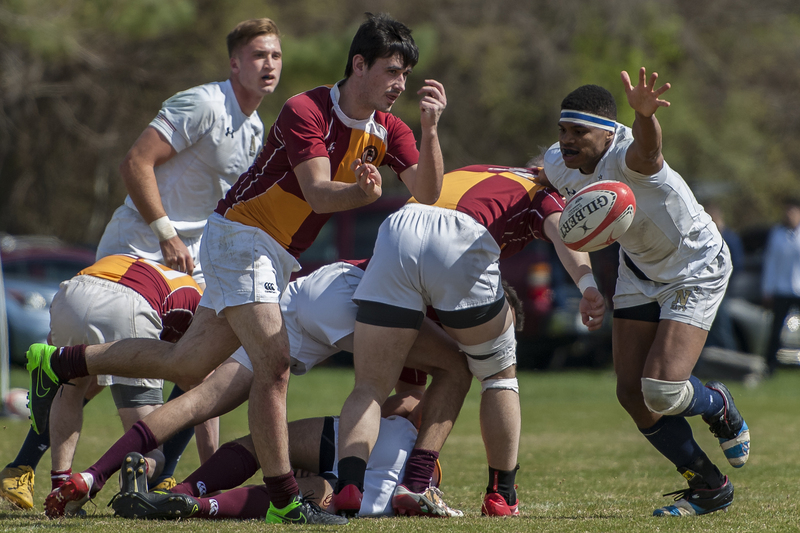 Dylan Boast, Sam Ross, and Tabo Maree scored two tries for the Red Wolves, while Brock Roper was good for seven conversions. Utah Valley University combined physical defense and opportunistic offense to defeat UCLA 40-14. UVU was successful at turning the pressure around and punished UCLA on interceptions. It was a good team performance, and a bit of an upset.